More fun with expiration dates: some things really DO expire! If you have been following this blog, you know that I’m fascinated with expiration dates. I’ve reported that MREs last far longer than their presumptive expiration dates, that water envelopes and SOS food bars also last past their printed expiration dates, that unopened commercial gallon jugs of water basically don’t have an expiration date according to the FDA, and that stored lithium batteries last for many, many years. Perhaps I should explore whether dates have an expiration date. However, you really should still check your emergency supplies every year or two to see if anything needs to be replaced due to expiration or obsolescence. Also, if you have been following this blog, you know that I moved over a year ago and have been so busy with other things that various precautions that I usually take for granted took me an embarrassingly long time to implement. One of the final things that I just got around to doing this month has been to dig my emergency supplies out of the “still to do” pile and check them. And I’m glad I did, because my canned food all had use-by dates in mid-2016. While it’s well documented that a tragically large amount of perfectly good food is thrown away due to arbitrarily chosen “use by” dates, in the case of canned food, some of these dates are real and should not be ignored. So my negligence gave me the opportunity to run a little experiment for you all! I opened up samples of each canned good that was 1.5 years past the use-by date to see what was still good, and I’m giving you the results here. I replaced all of my canned supplies whether good or not, but I tossed the ones that were bad and I’m incorporating the ones that are still good into my current meals. Corn (Del Monte) in water, expiration date Aug 2016: Tastes good, smells good, good crunchy texture. I’ve been snacking on it. Whole white potatoes (Safeway), exp. June 2016: Not exciting but still fine. Whole beets (Safeway), exp. June 2016: Perfectly fine. I’ve been snacking on them; I actually had a beet instead of a cookie the other day! Corn (Green Giant) “Steam Crisp” (packed without liquid), exp. Oct 2016: Ok, but not crisp and not sweet. Not unpleasant, but bland and boring. Almonds (Blue Diamond), unsalted, cans with peel-back foil and plastic lids, exp. Aug 2016: They smelled a little off and were ballooning at the sealed foil. Garbanzo beans / chick peas (Bush’s Best), June 2016: Smelled unpleasant. Sliced peaches in extra light syrup (Del Monte), exp. July 2016: Good flavor, but soft and mushy. I have supplies for Milo in our emergency kit as well: small cans of his Natural Balance wet food and also sealed bags of his w/d prescription kibble in the portable kit. 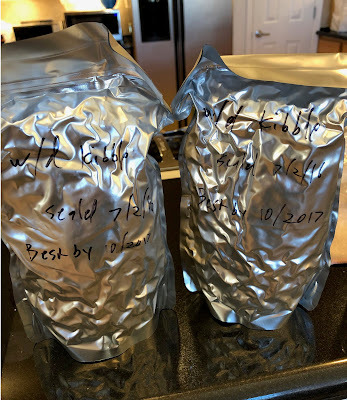 The kibble was the subject of my earlier article about using oxygen absorbers to essentially vacuum-pack supplies in sealed mylar bags. However, I have not known how long the kibble would last, and these bags were filled in July 2016 with kibble that itself had a printed use-by date of October 2017. As you can see in the photo, the bags were still shrink-wrapped from the oxygen absorbers. And when I opened one, the kibble did not have a bad smell at all. However, it also did not have much of any smell at all; it seemed to have become very bland at least to the nose. I ended up tossing it rather than using it so Milo could still have tasty food. Some of the wet food cans also had use-by dates of a year ago or more (I forgot to write down the dates). I did not even bother to open them; since wet dog food can smell a little odd to the human nose even when dogs love it, I would not want to guess if an extra odd smell had appeared so I just tossed them to not take any chances. In addition to having a week or two (I had one week but now I have two) of certain medications that I take like statins, which I tend to let go maybe a year past their use-by date but then swap out with my daily meds to refresh the ones in the kit), I decided several years ago to include a bottle of vitamin pills. 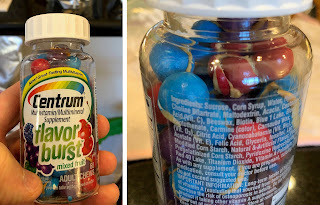 I decided to have a little fun and put in these Centrum “Flavor Burst” mixed fruit adult chews that look like brightly colored gumballs (I have a soft spot for artificially colored food with colors not even remotely resembling anything found in nature). Well, I noticed that they expired in 2014, and boy did they expire; a bunch of them had spontaneously exploded in the bottle! Oh well. I replaced them by adding in a couple of weeks of my normal multivitamin pills with the meds and I noted the expiration date from the source bottle. Then the one that really made me laugh is that I have a cool Energizer cell phone charger that works off of standard AA batteries, and I also have a solar chargeable charger pack that can charge cell phones. I opened both of them for apparently the first time in ages, and the accompanying photo will show you the problem! (For future historians who are reading this blog in the 23rd Century to see how we Silicon Age civilizations prepared for earthquakes, these wide iPod plugs have not been in cell phones for several years now.) 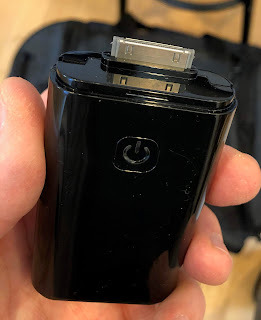 I included an appropriate adapter cable for the AA battery charger and swapped in a new cable for the solar power battery. So there you have it: not everything lasts forever. Even waiting an extra year from when you had planned to check your supplies is not a good idea. And even non-consumables can go bad as technology evolution leaves them in the dust. Now I must remember to back up this article… let’s see, where is that floppy disk drive again…? Do you have a ticking time bomb in your cupboard? Better check what is supporting your shelves! The earthquake precaution step nobody told you about: tell visitors about your preparations or else you could have problems! Are Command Picture Hanging Strips as good as maze picture hooks for quake-proof picture hanging? Special challenges: Can you seismically brace floor lamps and house plants? Should you? Know any students moving to the West Coast? Send them this! Did the movie San Andreas suggest the “Triangle of Life” myth? Just kind of. Do the collapsed buildings in Nepal mean that you should run out of a building during an earthquake? A burning question: what happens to unattended holiday/memorial candles in an earthquake? The Honey Quake story: Back up your recipes! Don’t be left in the dark: which kinds of power failure back-up lights work best in an earthquake? MRE shelf-life follow-up: Ever wonder what a 14-year-old MRE tastes like? 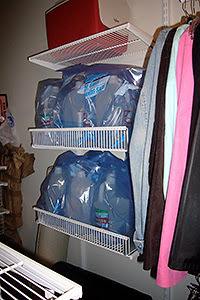 Does bottled water really expire? The FDA says no! At last, helpful hints on installing push-latches for cabinets! Experience an earthquake! And then go see the ostrich chicks and have lunch. Do I really have to stick down EVERYTHING? What about my TV remote? Double feature Part II: Can I get a fire hose to use after a quake if my house is burning down and the fire department is not coming? Double feature Part I: If you install a closet organizer system, don’t skimp on that last screw. Where should I keep that emergency kit? My earthquake preparedness website is moving! Small quakes: Good or bad for geology and psychology? This month, we are taking a break from the actual preparedness issues and will instead delve further into this annoyingly counter-intuitive recommendation to not run out of buildings during earthquakes. Even though I don’t plan on posting very often so I don’t add to the e-mail overload of people who subscribe, it just makes sense to post something on April 18th, the anniversary of the great San Francisco earthquake of 1906. There are two items on today’s plate: first a link to a then-young woman’s amazing description of what she experienced in the 1906 quake, and then I wanted to discuss a bit more about hanging pictures on the walls safely. "Why the heck do you live in that place with earthquakes??" This is my first experience authoring a blog, and there will probably be a few technical bumps along the way. Earthquake safety is an important topic in a place like the San Francisco Bay Area, and I hope that the information and occasional thoughts and tips here will be of interest to people who are trying to maximize their safety in our occasionally moving region. It's important to remember that even though we live in a place that is subject to earthquakes, which are occasionally pretty big, most of the risks associated with California earthquakes can be minimized by taking some precautions ahead of time. Just like one knows not to go jogging alone in the middle of the night in a dark park in a dangerous part of town, one should know what to do and not to do in regions subject to natural disasters. I'm kick-starting this blog with a few entries in a row, first introductory and then a few entries that have already been on my website. After that, I'll post occasionally; perhaps even relatively rarely so that I don't add to people's e-mail burdens. I've got no idea about how many people will be signing on to this, but welcome to those that do!